A 43-YEAR-OLD Dublin Airport ambulance driver, who thought her ambulance was going to be struck by a Ryanair plane as it was taking off, is suing the Irish Aviation Authority for psychological injuries she allegedly suffered as a direct result of what could have been a catastrophe at Dublin Airport. 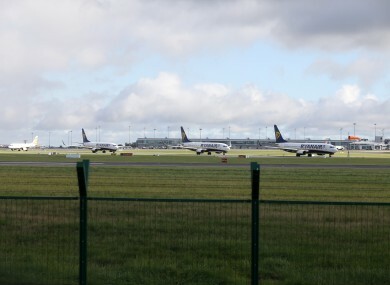 Roselyn O’Neill told the Circuit Civil Court that on 14 July 2013, she had been given permission to cross the airfield by the air traffic control. She had been about to cross a runway when she saw the plane coming ahead of her and about to take off. She told her barrister, Paul Andrew Gallagher, today that she slammed on the ambulance brakes, shouting through her radio that she was stopping her vehicle. She said that shortly after she had stopped, the air traffic controller told her to hold her position. O’Neill, of Beaverstown Orchard, Donabate, Co Dublin, said she felt the plane had been only metres away from her and if she had not stopped the ambulance, she would have hit the aircraft. Paul Romeril, a forensic engineer called to give evidence on O’Neill’s behalf, said that if she had continued driving, she would have just passed the back of the 35m long airplane, which was travelling at more than 200km per hour at the time. He said the avoidance of an accident could have been a matter of seconds. Gallagher, who appeared with Anderson & Gallagher solicitors for O’Neill, said she had continued working that day but two months later had developed psychological injuries, which included suffering flashbacks of the incident. O’Neill told the court that she started to feel guilty for what could have happened to passengers on the aircraft and to air traffic controllers. She said she was still taking antidepressant medication prescribed by her doctor. She said she had needed to take time off work and was now suing the Irish Aviation Authority, which is in charge of air traffic control at the airport. She alleged negligence on their behalf. Barrister Paul Fogarty, for the Aviation Authority, said his client denied liability. It claimed that although there had been an error on the part of air traffic control, the plane had been 86m away from Ms O’Neill when she had stopped her ambulance. Mr Fogarty said the Authority claimed that as no accident happened that day, Ms O’Neill’s injuries were caused by her own imagining that she could have hit the plane. He said the Authority was also claiming that Ms O’Neill had a history of depression. Circuit Court President, Mr Justice Raymond Groarke, prior to defence witnesses being called, adjourned the case to allow a psychiatrist to give evidence with regard to Ms O’Neill’s injuries. Earlier he dismissed Ms O’Neill’s employer, Dublin Airport Authority, as a defendant in the case which will now only continue against the Irish Aviation Authority. Email “Dublin airport worker sues over fears her ambulance almost hit plane on runway ”. Feedback on “Dublin airport worker sues over fears her ambulance almost hit plane on runway ”.